The Flash delivers its own take on a time loop when Nora keeps repeating an hour that always ends up with at least one of the team dying. It’s surprising that it took this show until the second half of its fifth season to deliver a Groundhog Day inspired episode given all the time travel shenanigans that have happened over the years. We’ve had a few do-overs on certain situations but nothing to this extent. Doing this now makes for a good Nora showcase as one thing season 5 has been consistently good at is having her learn more about being a Speedster and a hero under Barry’s instruction. This makes for the second time that Nora has had to deal with a situation on her own while Barry is otherwise engaged and it’s used really well. Nora is very confident when she knows she can turn to Barry for backup to help her out when she feels that a situation is too much for her so when he isn’t around and things don’t go as planned she has no idea how to deal with it and panics. 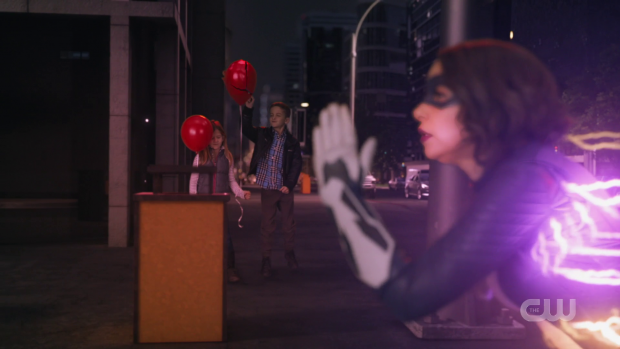 In this case Cicada kidnaps Iris and Nora rushes into the situation with Killer Frost in tow only for Killer Frost to end up killed by Cicada’s dagger. Naturally this outcome is less than ideal so Nora rushes back in time looking to fix the situation by in theory being prepared for it. Unfortunately no matter what she does one of the team ends up being captured and usually a different member ends up dead. It has been noted in the past that the timeline fights back against changes in some way though this has never actually been depicted properly. Nora’s inability to entirely prevent the death of a member of Team Flash is actually a good visual example of how the timeline might go about correcting against the intervention of a wayward Speedster, that is until Team Flash pull together and find a way to solve the problem with all of them alive and well. Cop out endings aside, this amounts to an effective lesson for Nora. This experience could teach her to have more respect for the timeline and fully consider the situation before deciding to take action. In the very first crossover Oliver pointed out that Barry never recons an area before rushing in to confront the situation despite having more than enough time thanks to his speed. The same lesson could have been applied here as Nora appears on the roof without any sort of assessment being made and the consequences of that mistake are dire. She never learns that lesson as she constantly rushes in hoping that her determination will be enough to enable her to win. 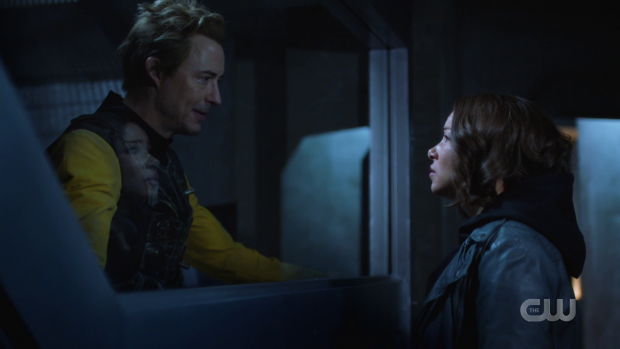 Even though she doesn’t learn the lesson about doing recon before approaching a situation, Barry’s words of wisdom about messing with the timeline using Jay Garrick’s simple yet effective broken coffee mug analogy ring true and she rushes back to the year 2049 to check this with Thawne who assured her that he knows what he’s doing and that she should trust in his plan. If anyone knows about messing with the timeline it’s definitely him in fairness though it’s becoming more clear that self interest is the root of his motivation. In many ways I feel like I’m caught in a time loop when talking about this show. This episode relies on a really tired storytelling crutch that this show constantly relies on; characters unnecessarily withholding information. I’ll give Nora the benefit of the doubt on her first attempt as she could impulsively decide in the moment that going back n time would allow her to fix it easily though any attempt after that has her behave stupidly so that there is a story to watch. It has been established time and time again that Team Flash are better off being upfront with one another and facing a problem head on together because they will be more effective that way. Nora has theoretically learned versions of this lesson over the course of the season so it makes no sense that she would isolate herself and keep her attempts to fix the problem a secret. As soon as the whole team becomes involved the problem is nearly instantly solved. It appears that I’m resigned to continue pointing out that the characters will always forget this lesson no matter how many times they learn it. Of course it’s so obvious – be myself! Another issue is the application of the rules of time travel. I’ve already mentioned that the ending was a cop out which it is but on a broader level it ignores the attempted time travel rules in a variety of ways. One of these is the absence of Time Wraiths; Nora travelling back in time 52 times to prevent the death of one of the team would definitely create significant enough ripples to attract their attention. The counter to that is the reference to the potential for this to be a fixed point in history that can never be changed. If it can’t be changed then there’s no need for Time Wraiths as there is no actual risk to the timeline. I could accept that the one who ends up dead is of little significance as the important thing for the timeline is that the events play out in such a way. It’s vague but it could work. Of course this isn’t a fixed point in the timeline because teamwork saves the day rendering the entire thing as almost entirely bereft of threat. In theory this would have been a good episode to have a character exit the show. It would give the events some weight as the stakes are tangible and the outcome unavoidable which sets up a character to either die unexpectedly or one of them to sacrifice themselves heroically. If none of the cast are leaving then the obvious choice is Sherloque as there is an abundance of other versions of that character to choose from though equally if another character were to meet their end it could be a lot more effective as there wouldn’t necessarily be a replacement. The ending of the episode could even largely be the same with Team Flash pulling together and thinking they’ve won only to have someone die as a shock twist. It would cement the idea of the fixed point in history as well as giving the episode tangible stakes that make it seem anything other than disposable. The time loop concept requires background plotting to make it work in order to show the true impact of the changes being made. Other than the merry go round of deaths there is the repeat of Cisco’s date with Kamilla (Victoria Park); something that he constantly approaches wrongly thanks to some insufferable advice from Ralph. He cyberstalks her and concludes that her “type” is pretty much anything but Cisco so we see a few versions of this first date where Cisco tries to be something he’s not whether that be the “classy” businessman, gym addict or social media influencer. This all builds to him realising that he should just be himself because if she doesn’t like the man he actually is then there’s no point in pursuing a relationship anyway. I didn’t mind this as such even if Ralph’s contribution did nothing for me because it’s the first decent example of dealing with the ending of a relationship that we’ve had where Cisco’s concerned. He’s at the point where he might be ready to move on but is reluctant to do so and isn’t sure how to go about it. It’s easy to see why he would be blinded by the obvious by his own anxiety and the final attempt where he relaxes into the situation is great to watch. So…time is like a coffee mug? At this point we can pretty much give up on the idea of a moral debate around the implications of the cure. It now exists and will be used on Cicada. Everyone is on this same page and there is nothing more to say about that. It’s a real shame as earlier episodes established two clear positions on the argument held by different characters so everything was in place for this conversation to be had. Perhaps it will come up again for next season’s big bad but by then it may be too late for it to be taken seriously. Cicada has definitely reached the point where he can give nothing else to the overall story. Having him threaten the team before he’s thwarted and escapes to do the same in the following episode is becoming really repetitive and his threat level has massively diminished because he appears to be so easy to defeat week on week. 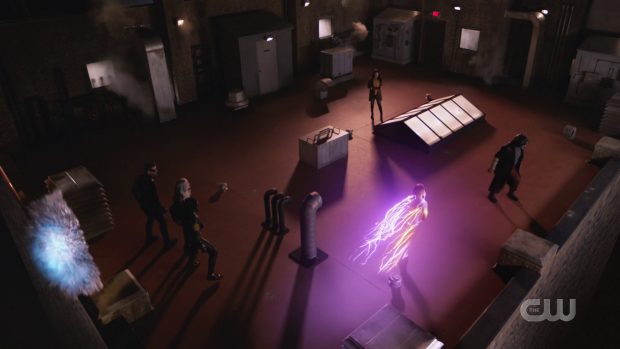 This episode is a great example of hos non threatening he is at this point as the capture of any member of Team Flash failed to feel like a massive problem even before the time loop conceit was introduced. Based on the available evidence there is no way the show can believably sustain him as a villain for another 9 episodes so hopefully the cure being ready means that he’ll be quickly defeated for good. There are some intriguing minor touches such as Sherloque immediately noticing that something wasn’t right with Nora and coming to the realisation that she’s reversing time through reading the not so subtle clues that she gives off. Despite my misgivings about this character earlier in the season I currently find him to be a remarkable asset to the show. He has settled into the group dynamic, forged meaningful connections with some of the cast and continues to be engaging in his investigation of Nora. We’re now at the point where he is really close to discovering her secret and I look forward to seeing the impact that has. Another disposable outing that doesn’t really do anything clever with the time loop idea and highlights the lingering issues the show has. 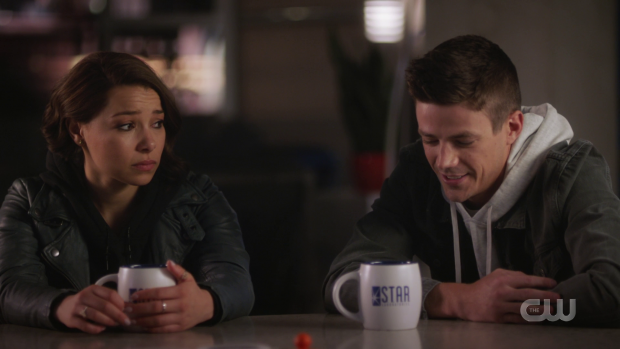 Placing Nora in a situation where she doesn’t have Barry for backup is a great idea as it can test what she has already learned while preparing her for new lessons. The situation is set up well but Nora doesn’t really learn anything and continues to make the same mistake. It’s forgivable that she would reverse time once to try and fix the problem herself but after that it would have made more sense for her to go to the team to ask for help. By not doing this she forgets the lesson of Team Flash being more effective when they’re upfront with one another and just comes across as stupid for failing to realise this quickly enough. The rules of time travel are all but thrown out here as Nora is able to reset time 52 times with no consequences. There is mention of it being a fixed point in history though that means nothing when teamwork can save the day. If there had been any consequences to the events of this episode at all then the idea that the timeline is a dangerous thing to mess with would have some weight behind it. Another problem is Cicada who has all but ceased to be a threat at this point. Every week he attacks members of the team in some way, is thwarted and escapes to start the whole process again. There is clearly nothing more this character can bring to the show yet he is still around as Team Flash kill time getting the cure ready. 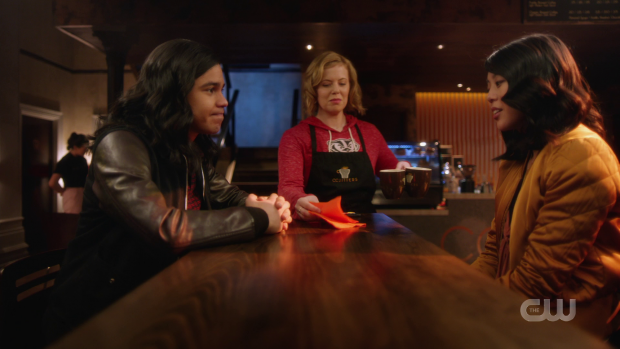 It isn’t all bad though; I liked Cisco’s difficulty realising that being himself with Kamilla is the best way to be as it would make sense for nerves to cloud his mind considering this is his first foray back into the world of romance after breaking up with Gypsy. Unfortunately there is to be no debate about the ethical implications of the cure; that ship has sailed and nobody objects to using it on Cicada. Sherloque continues to be a great asset to the show as well. His quick realisation that something wasn’t right with Nora before easily figuring it out was great and the added information he has in his ongoing investigation of her gets him ever closer to discovering the truth. If you want to chat to me directly then I’m on Twitter as well. If you like our content and want to help support the site, we would appreciate all donations.